Effects of drought stress on the evergreen Quercus ilex L., the deciduous Q. robur L. and their hybrid Q. × turneri Willd. Five-year-old trees of deciduous Quercus robur L., evergreen Q. ilex L., and their semideciduous hybrid, Q. × turneri Willd. (var. pseudoturneri), growing in pots, were subjected to drought stress by withholding water for 18–22 days, until leaf water potentials decreased below −2 MPa. 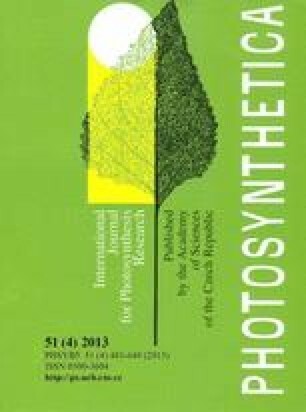 Gas-exchange rates, oxygen evolution, and modulated chlorophyll (Chl) fluorescence measurements revealed that by strong stomata closure and declining photosynthetic capacity down to approximately 50%, all three taxa responded with strongly reduced photosynthesis rates. In Q. robur, photochemical quenching of the drought-stressed plants was much lower than in nonstressed controls. Dissection of the occurring events in the photosynthetic electron transport chain by fast Chl fluorescence induction analysis with the JIP-test were discussed. Acknowledgements: The present study was financially supported by the research funding programme “LOEWE — Landes-Offensive zur Entwicklung Wissenschaftlich-ökonomischer Exzellenz” of Hesse’s Ministry of Higher Education, Research, and Arts. We like to thank two unknown reviewers for very helpful remarks on the manuscript.